From 2011 - 2015, Band of the Day unearthed the best new music by delivering one new artist a day, every single day. Through expert curation, free music (commercial-free and uninterrupted), a stunning user interface, videos, photos, bios, and more, we helped you discover over 1400 new bands from all over the world. During this time, we had the honor of being selected as App of the Year Runner-Up (to Instagram in 2011), iPhone and iPad App of the Week, and iPhone and iPad Hall of Fame. 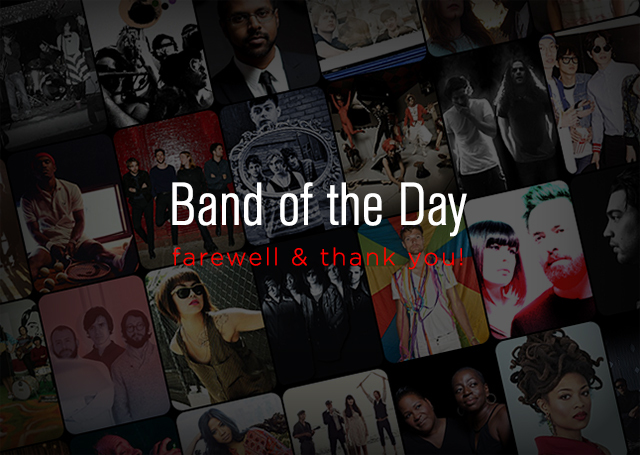 Band of the Day was also a New York Times: Top 10 App of 2011, and was featured in TechCrunch, Los Angeles Times, The Guardian, CNN, Chicago Tribune, Gizmodo, and more. It was incredible being able to share so many new music discoveries with our users, and even though we won’t be featuring anymore new bands, you will still be able to access all of the previously-featured content here. We also welcome you to still interact with us through @bandoftheday and facebook.com/bandoftheday.